Last week we started discussing the bedrock principles of what makes SEALFIT training extraordinarily effective. As I mentioned last week, high-intensity is the secret ingredient. But what you pour that high-intensity into makes a lot of difference. It’s interesting that “High-Intensity Training,” or “HIT,” was central to the training program advocated by the late Arthur Jones and his Nautilus company. Rather than spending hours every day in a gym, Jones argued you’re better off with one or two sets of each exercise, pushing to momentary muscular failure and eliminating rest between sets and exercises. Jones’s methodology became prominent with the exercise machine boom, that he also had a lot do to with. Jones set out to make something “superior to a barbell”—and made a lot of money when people listened to him. In gyms that began popping up all over the country, barbells, plates, and dumbbells were replaced (or at least sidelined) by rows of Nautilus stand-alone machines and Universal circuit machines. One of the popular sales pitches around the machines was that they allowed you to “isolate” a muscle and avoid the fuzziness that might come with determining strength from a compound movement that involves a number of muscle groups. The marketing of the time worked: the thinking that exercise machines were superior to free weights took hold. YMCAs and bodybuilding gyms were transformed. National chains of fitness centers began to emerge with exercise machines as their centerpiece attraction. The weight rooms of college and professional sports teams were overhauled. Big dollars changed hands: Although barbells, weights, and dumbbells could be purchased for hundreds of dollars, the machines cost thousands and even tens of thousands of dollars—each. Jones was a main driver of this discussion. He had a lot to say about how strength was measured and the value of high-intensity, full-range of motion and muscle exhaustion. One thing that has transpired since the early 2000’s is that many gyms have snapped back to the old days—barbells, barbell weights, squat racks, dumbbells and basic gymnastics apparatus—like pull-up bars—have been rediscovered. Take a fresh look at the Ohio State football weight room: If there’s a bicep curl machine somewhere, it’s not out in the open. A great deal of credit goes to the founder of CrossFit: Greg Glassman. Glassman was a former gymnast and personal trainer that deliberately rejected using weight machines in favor dumbbells, gymnastics rings, barbells and the like. He was banned from so many of the commercial gyms he worked at because of his wild success at achieving fast and often shocking results with small groups of clients—and using dynamic movements like thrusters and Olympic lifts—that he was considered a threat to the business model that large commercial gyms counted on. It was when all the doors had been shut on him in Santa Cruz that he was driven to open up his own CrossFit gym. Now, there are more than 11,000 CrossFit affiliates around the world. Functional movement is a strength and conditioning buzz-phrase these days, and you may get different interpretations should you ask a physical therapist, a sports scientist, and a personal trainer at the local LA Fitness. When it comes to the SEALFIT definition, we keep it pretty simple: A functional movement is a movement you use in real life to accomplish work. Running and swimming are functional movements. Digging a foxhole is a functional movement. Picking up a log off the ground is a functional movement. Pushing a wheelbarrow full of cinder blocks across a parking lot is a functional movement. Fireman-carrying your buddy a quarter-mile is a functional movement. Pulling yourself up over a cliff is a functional movement. Throwing and jumping are functional movements. All of these so-called functional movements have one thing in common—they employ universal motor recruitment patterns to get work done. Which is chiefly why, in a gym setting or on the stark, no-frills Grinder, most of the exercises in use can be described as functional movements. So that’s the deal when it comes to SEALFIT: The emphasis is on movement. The skill of the movement, the speed of the movement, the power of the movement, the coordination and balance within the movement. Want to get started? You don’t even have to buy barbells or join a gym. There are no excuses—Air squats, push-ups, burpees, running, mountain climbers, planks—you can start right this minute with 100 push-ups on the floor in front of you. Maybe find a tree branch in the backyard or a horizontal bar on a playground and you can do pull-ups. You can do box jumps on a stone bench. Have a few bucks burning a hole in your pocket? You can start your own gym with a sand bag and a jump-rope. 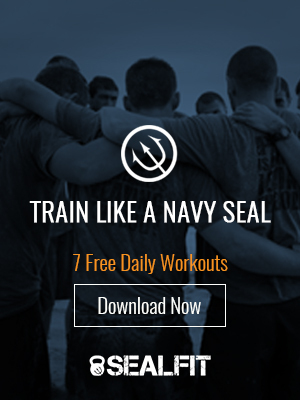 Next time we’ll dig into the final core training principle at the heart of SEALFIT: Variation.